Not running the Chicago Marathon on Sunday, but have friends and family who are? You'll definitely want to be able to stay updated on their progress in the sea of runners and easily find them after the fact. 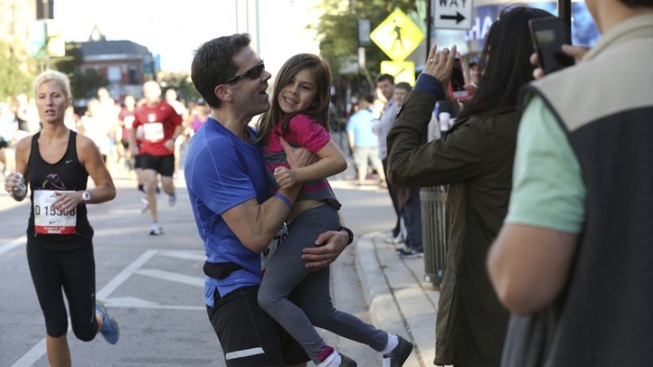 The 27th Mile Post-Race Party/runner reunite area of Grant Park (Butler Field) opens to spectators at 9 a.m. To access this area, spectators must pass through security and bag screening at Gate #1 (Jackson Drive and Michigan Avenue) or Gate #3 (Congress Parkway and Michigan Avenue). The party stays open until 3:30 p.m. with live music beginning at 10:30 a.m. and beer ticket redemption and sales from 11 a.m. to 3 p.m.
Marathon officials recommend spectators support runners from elsewhere on the course, and meet runners after the race at the designated runner reunite area in Grant Park. Eight on-course McDonald’s locations are designated as Runner Update Centers where spectators can go to check on the status of their runners by looking them up online. Runner tracking and live results will be available at chicagomarathon.com. Race day can be crazy, so be sure to come up with a back-up plan in case you can't find your party in Grant Park.